Silverfish is whitish and mild brown grey in colour. The colour of silverfish may differ to bluish silver. It is like a tear drop in shape and it is approximately 12 mm to 19 mm in length. Long three bristles on rear and it produce from an egg to adult. Knowing Behaviour, Diet & Habits for silverfish control natural treatment. Silverfish dwell in damp areas like basements, bathrooms, kitchens and attics. Moreover, attracted to damp clothing. It feed on carbohydrates, as well sugars and starches. Cellulose, Shampoos, Glue in books, Linen, Silk and their food source are dead insects, which are often found in unopened packages of food. Signs of a Silverfish Infestation for Silverfish Control in Canada. Silverfish can be detected in a sink or bathtub. Their faeces are like pepper flake which help to indicate presence of silverfish. Silverfish move very quickly and are nocturnal. Silverfish are harmful and secretive. Silverfish reproduce quickly. Their destructive feeding habits make them famous and known. Common places in your home where you can find Silverfish. 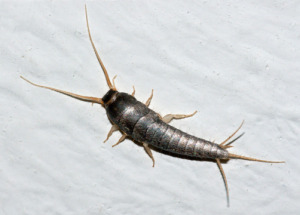 Silverfish infest in damp and dark places and can be found in basements, wash rooms, and attics. Silverfish survive in any environment but in high humidity area it develop faster. How Exopest Pest Control can help you control the Silverfish infestation ? We will create a customised approach, if your home have a high population of silverfish. You should hire a best professional team from Exopest for silverfish control. Exopest’s silverfish control products and services are designed to perform important tasks to destroy silverfish population including trap kill methods to kill entire population. Silverfish infestations can only be destroyed by professional treatment. Exopest’s pest control expert will be able to deal the situation within your building or place and determines the most instant and effective methods of extermination. Call immediately at the first sign of an infestation, contact your own local Pest Control Professional Exopest 604-760-1542.